According to KGO News, there was an explosion at 10:45 tonight, in a building on Van Ness Avenue at Washington Street. The condominium was under construction, and no one was inside when the top-floor explosion occurred. The blast is thought to have been caused by a space-heater which had been left on, near a propane tank. Glass was blown across eight lanes of Van Ness Avenue, and destroying a restaurant awning on the opposite side. Though the explosion blew out the glass on two sides of the building, and caused some structural damage, there were no injuries. CNN.com has a special report on the power crisis in California. A severe winter throughout much of the country has heated up a debate over soaring utility rates. In California the utility market is especially chaotic. Wholesale electricity prices there average $330 per megawatt-hour, 11 times higher than a year ago, and the threat of rolling blackouts has sparked outrage among consumers. 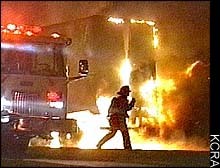 Shortly after 9:00PM Tuesday, an 18-wheel truck/trailer crashed into the California State Capital building and exploded. One witness reports that having seen the truck circle the building twice before intentionally ramming into it, and exploding. It’s unknown at this time whether the incident is a suicide attempt, terrorist act, or mechanical failure. Sacramento police have cordoned off the entire area surrounding the building. Local news reported that the driver of the truck was killed in the crash, and that there were no other known casualties. “New York Times Co.’s Internet division is laying off 69 employees, or about 17% of its work force, the company said. The high court voted 5-4 to stop a recount that had been ordered Friday by the Florida Supreme Court to address claims by Gore that some votes cast for him on November 7 were never counted. One dissenter, Justice John Paul Stevens, wrote that “the legitimacy of the election” might be forever stained if the recount was stopped. The court ordered oral arguments for 11 a.m. Monday. recounts. The decision was reached by a 4-3 vote. Recounts are to begin immediately. The court also ordered 383 votes to be added to Gore’s total, which reduces Governor Bush’s lead to 154 votes. The Bush campaign has already announced their intention to appeal the decision to the U.S. Supreme Court. Vice President Al Gore won a major victory today in his courtroom quest for the presidency when the Florida Supreme Court said that thousands of disputed ballots should be counted by hand immediately. The legislation contemplated by GOP leaders could set up a contest between two rival Florida slates when the Electoral College votes are cast Dec. 18 and then counted in Congress on Jan. 6. That, in turn, could ratchet up the controversy even further in the contest to pick a president. LOS ANGELES, Calif — November 14, 2000 — Scour, Inc., the world’s leading Internet search destination for digital entertainment, announced today it will voluntarily shut down the Scour Exchange community within 48 hours to facilitate a resolution of pending litigation and a sales of its assets in the U.S. Bankruptcy Court. “Norwegian divers have found that a Russian nuclear submarine lying on the bottom of the Barents Sea is flooded, and an official says there’s no chance of finding any survivors. “Norwegian spokesman Captain Rune Fredheim said that meant the rescue effort was over at the site north of the Arctic Circle. Napster has been issued a temporary stay on the temporary injunction which would have forced it to shut down its servers.